If you love asian food you will absolutely adore this delicious and easy recipe. It’s the perfect dish for something a little bit different, it’s much lower in carbs than many other asian dishes, and it’s a little bit fun, so the whole family can enjoy it! Extra crunchy vegetables have been added to this recipe to help you feel fuller for longer and keep your blood sugar levels stable, both of which make it easier to stay on track with your weight loss plan and avoid those sugar cravings after dinner. 1: Cook the rice in a saucepan or rice cooker. 2: Select four lettuce leaves about the same size, and trim if necessary with scissors to make large cups. Place in a large bowl filled with iced water..
3: Spray a non-stick pan with oil, and heat on medium. Stir-fry green onion, chilli, garlic and ginger for 1-2 minutes or until onions softens. 4: Add mince and cook for about 5 minutes, until colour changes. Add the broccoli, snow peas, and capsicum and cook 4-5 minutes or until just tender. 5: Add hoisin, soy sauce, sesame oil and water chestnuts and continue to stir-fry for another 2-3 minutes. 6: Add cooked rice, water chestnuts, sesame oil and coriander to mince mixture in pan. Toss until well combined. 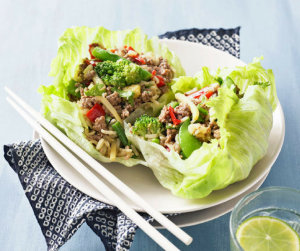 7: Arrange lettuce cups on a platter. Spoon a little of the mixture into each leaf and serve.